Home > Notions > Pins/Clips > CLOVER 3155 - Wonder Clips - 10pcs. 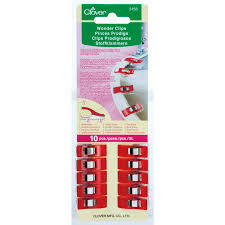 CLOVER 3155 - Wonder Clips - 10pcs. Clip and hold, Clip and Sew right where you need it! Open wide for holding multiple layers of fabric. It won't damage or distort the fabric. Great Holding capacity for different types of crafts.1⁄4" and1⁄2" seam allowance markings on the base.